This kind of Friday Night Twitter Fight has become a hallmark of the Trump administration. The president has spent his Friday evenings tossing jabs at Leakin’ James Comey, the “Fake News” media and Crooked Hillary Clinton. A few weeks ago, he spent the sixth day restarting a fight he’d already won by kidney-punching a half-unconscious NFL over its revised National Anthem policy. And now the LeBron jabs. Some of Trump's supporters theorize it's simply part of his nature as an alpha male to attack those who have publicly criticized him, which both Lemon and James have done recently. But this is hard to buy, because the true alpha move would be to ignore these men and say, through silence, “I’m so powerful that none of you is worth my attention.” Some critics, like John Gartner at Slate, speculate that Trump’s aggressive tweeting is part of his nature as a malignant narcissist. I hesitate to embrace this theory, because I'm not qualified to diagnose recognized psychological conditions, but I have a theory of my own. [post_ads]I am convinced Trump suffers from what I like to call Return-to-Rocky Disorder. This is what happens when someone tries to reclaim a persona he’s not in danger of losing. It’s the compulsion to make people see you as your most successful character when those people haven’t stopped seeing you as that character. This is what Trump does every time he picks a Twitter fight with a political rival, a journalist, or a real housewife of Murfreesboro. “Rocky," of course, refers to Rocky Balboa, the titular character created and portrayed by Sylvester Stallone in the legendary 1976 boxing film. From the moment Stallone mumble-shouted the words “Yo, Adrian, I did it” in the 1979 sequel, the character of Rocky Balboa became fused to the pop culture DNA of the actor portraying him. With those five words, Sylvester Stallone became the eternal Italian Stallion. He was now free to play Hamlet or King Lear for the rest of his life, without losing an ounce of his Rocky-ness. Even though Stallone has returned to the part numerous times in his career, after Rocky II, he never had to. Trump might be an alpha male. He might be a malignant narcissist, but above all, he’s a showman who won the White House by playing the part of a political Rocky Balboa — minus, of course, Rocky’s humility and tenderness. Trump sees himself playing the part of the underdog no one thought could win, but who knocked out champs like Apollo Bush and Hillary Creed. He’s found his greatest success as Captain Counterpunch, the hard-nosed brawler who will always hit back at those trying to take him down. That’s the role he likes playing the best. All the other roles bore him. But it’s not just that Trump finds these other roles uninteresting. He also finds them detrimental to his image, convinced that acting presidential will take away his Rocky-ness, especially if that other role isn’t very well received. That’s why he frequently creates diversions during a bad press cycle. Whenever his popularity is waning or threatened, Trump seeks to recover it by playing the hits. He puts the gloves back on, casts someone (usually the media) as the new Apollo Creed, and knocks the bad guy out. With those words, he became the eternal Counterpuncher in Chief, the guy who wasn’t afraid to hit the political elite, the plucky pugilist who landed a haymaker on Hillary Clinton that no other candidate would have dared throw. With those five words, before he even won the presidency, the persona of President Rocky was eternally fused to the pop culture DNA of Donald Trump. He could kiss Hillary Clinton in the middle of Fifth Avenue and not lose a single vote from the crowd still chanting “lock her up” and cheering him for knocking her down. It’s understandable he wants to return to his most successful role when things aren’t going well, but if he seeks to accomplish his agenda or win reelection, it would behoove him to realize the already locked-down Rocky-loving vote isn’t enough. If Democrats nominate a relatively likable and sane human person in 2020 (quite the presumption, I know), he’ll need a wider appeal. So it’s a good thing that Trump’s inextinguishable Rocky-ness has freed him to play the kind of role that just might win the hearts of the Maybe Trump crowd. And, believe it or not, it wouldn't have to be so hard to win them. For a good chunk of Americans, Trump's agenda is not the problem. It’s his demeanor. They like the pro-life judges, tax cuts, gun rights, religious freedom, strong economy, and strong borders he offers, but they’re not sure they want to sacrifice their dignity to get those things. Those who like the way things are going in terms of policy are generally reluctant to switch horses midstream, but many of them will do precisely that if the horse keeps bucking them into the river every time he feels the urge to stomp a guppy that looked at him sideways. At the same time, if the horse wants us to stick with him, he doesn’t need to start liking the guppies. He just has to quit stomping them long enough to get us where we want without embarrassment. Pragmatic cynicism is baked into the cake of modern politics. We don’t expect our leaders to say the right things and mean them. We just expect them to say the right things enough times for us to convince ourselves or our neighbors that we’re good people for supporting the right-thing-saying politician who shares our political goals. On account of all this, Trump doesn’t need to convince Maybe Trumpers that he’s genuinely turned over a new leaf and become a diplomatic leader. Nor does he need to renounce the old role. He just needs play the new role of President Diplomatic. He doesn’t need to believe the new lines. He just needs to recite them. And above all else, he needs to quit burning the script and reverting back to his preferred character every time he feels threatened or bored. 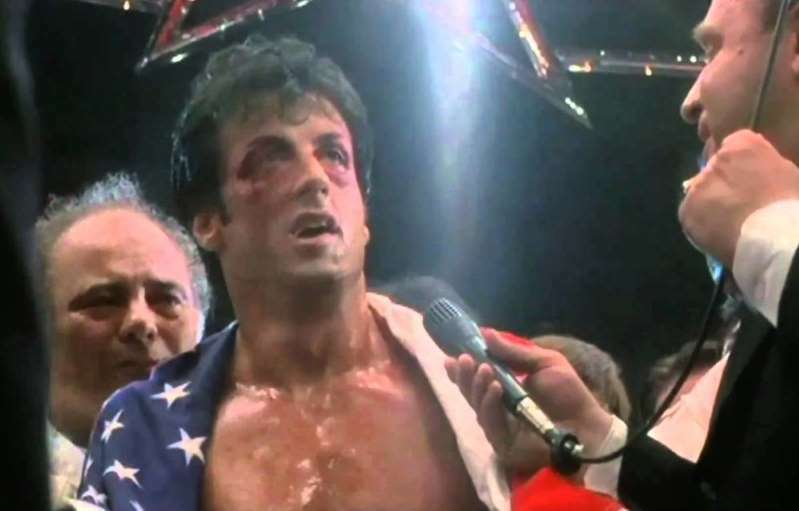 Donald Trump became President Rocky the moment he said “because you’d be in jail.” He’ll never stop being President Rocky. And he’ll always have the support of those who love that character. But their support isn’t enough. He needs to move on to more grown up roles. Maybe he’s not capable of playing them. But if he is, he’d better start playing them soon.